I have a guest post on the Scientific American website that looks at the historical trends and recent events in the growth of space debris. The end of the post talks about the enormous quantity of debris that would result from the breakup of a large satellite—the kind of thing that could result from an anti-satellite attack on a large spy satellite. It notes that destruction of a single 10-ton satellite could double or triple the amount of large debris (greater than 1 centimeter) in low Earth orbit. Such an event could therefore swamp all the efforts being made to mitigate debris production. 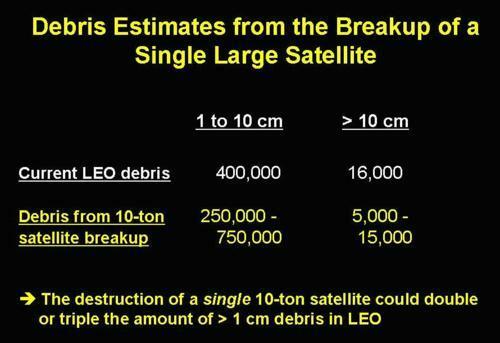 NASA’s Standard Breakup Model is the best model around for estimating the number and size distribution of debris from a satellite breakup, and is based on past observed breakups. It gives 263,000 as the number of debris particles larger than 1 cm that would result from the complete fragmentation of a 10-ton satellite. The breakup of the Fengyun 3C satellite due to China’s anti-satellite test, however, produced more than three times the amount of debris estimated by the NASA model. So I use a similar factor of three to get an upper bound on the amount of debris in the case of a 10-ton satellite. The table below gives these numbers. For an introduction to space debris (from 2007) click here.